Whenever we see a coil gun project on the Internet, it seems to involve a bank of huge capacitors. [miroslavus] took a different approach with his gun–he wanted his project to be built without those monster caps. It’s powered by quadcopter LiPo batteries, 2x 1400 MaH drone batteries wired up in series and triggering 21SWG copper coils that [miroslavus] created with the help of a custom 3D-printed winding rig he designed. 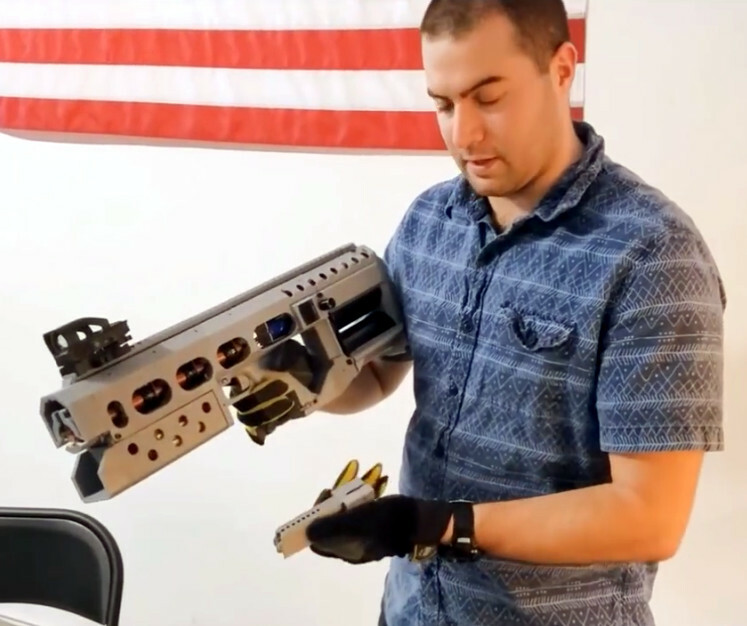 The rigs have ridges to help you lay the coils down neatly, and they also have mounts for photodiodes, ensuring the gun knows when it’s loaded. When triggered, the Arduino Nano activates a pair of IRF3205 MOSFETS with logic signals stepped up to 20V, shooting lengths of 7mm or 8mm steel rod. The gun isn’t exactly creating plasma discharges with its launches, but it’s a fascinating project nonetheless. Check out the disposable camera coil gun project and the coil guns for newbies posts we previously ran. A common complaint in the comments of many a Hackaday project is: Why did they use a microcontroller? It’s easy to Monday morning quarterback someone else’s design, but it’s rare to see the OP come back and actually prove that a microcontroller was the best choice. So when [GreatScott] rebuilt his recent DIY coil gun with discrete logic, we just had to get the word out. You’ll recall from the original build that [GreatScott] was not attempting to build a brick-wall blasting electromagnetic rifle. His build was more about exploring the concepts and working up a viable control mechanism for a small coil gun, and as such he chose an Arduino to rapidly prototype his control circuit. But when taken to task for that design choice, he rose to the challenge and designed a controller using discrete NAND and NOR gates, some RS latches, and a couple of comparators. The basic control circuit was simple, but too simple for safety — a projectile stuck in the barrel could leave a coil energized indefinitely, leading to damage. What took a line of code in the Arduino sketch to fix required an additional comparator stage and an RC network to build a timer to deenergize the coil automatically. In the end the breadboarded circuit did the job, but implementing it would have required twice the space of the Arduino while offering none of the flexibility. Not every project deserves an Arduino, and sometimes it’s pretty clear the builder either took the easy way out or was using the only trick in his or her book. Hats off to [GreatScott] for not only having the guts to justify his design, but also proving that he has the discrete logic chops to pull it off.